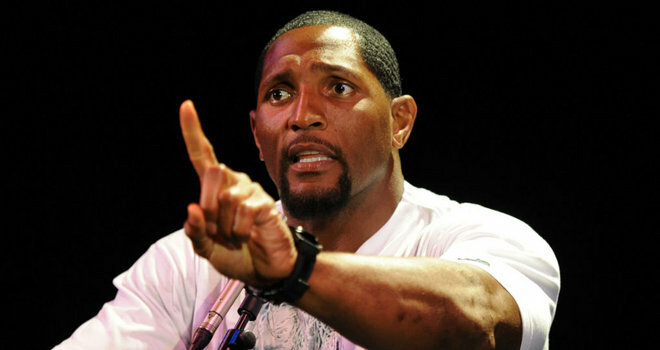 It is hard to move today because of the deluge of sycophantic articles that have descended upon us after the announcement that Baltimore Ravens defensive player Ray Lewis will allegedly retire after this current NFL season. We are literally knee deep in adulatory prose being adorned on the lad. 90% of the articles being written about him are a complete whitewash in that they do not speak a single bad word about the chap. Even the 9% that do raise some quiet questions about his murky past still throw countless bouquets at him, blinding you with his impressive NFL statistics, or feel-good anecdotes about how he great he is in the Baltimore community. Wonderful. What a guy! This column never thought it would say this, but we are among the 1% (at least when it comes to Ray Lewis). You can throw all the statistics you want at us, you can attempt to drown us out with stories about Lewis helping Little Johnny, Billy or Mary in Baltimore, fine, whatever, however you will never remove the odious stain that is the events outside an Atlanta nightclub in January 2000. You will never remove it, because Lewis has managed to get away with it without ever telling the truth about it. Instead Lewis has managed to rebuild his reputation completely with anyone who raises any questions about him being drowned out violently by his apologist, adoring legion of fans. We are going to hear Ray Lewis called a number of things the next few days, as writers trip over themselves in a race to see who can complement him the most. I believe Lewis is one thing for sure. A magician, an illusionist of the highest order. Lewis preaches one thing (an all-encompassing, suffocating dedication to spouting religious mantras) while practicing another. How many dedicated religious folk do you know have six children and (allegedly) zero contact with any of the four mothers of those children? Probably not many, right? The genius of Lewis is that he can act one way in his private life, but he still manages to maintain a highly polished, superstar image in his professional life. Here’s the thing, there are no doubt many of you reading this thinking ‘Leave the man alone, he has suffered for his sins and he is rehabilitated’, the old ‘everyone deserves a second chance’ argument. No doubt there will be a number of angry emails from middle aged, white NFL fans from the Baltimore area rushing to defend their hero. I would ask those who would defend Lewis, has he really paid his dues? Has his ‘good behaviour’ the last decade really wiped away the stain? 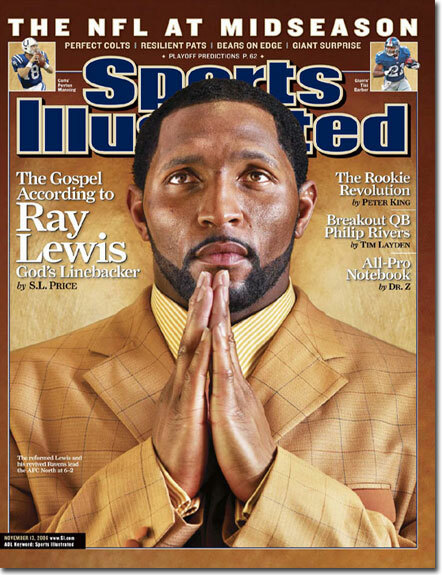 Those afore mentioned great acts of charity and all those wonderful gaudy NFL statistics pale in comparison to one thing, Ray’s incredible magic trick in turning his reputation around into levels reserved for the cleanest and most commendable superstars after the events in Atlanta in 2000. Let’s revisit the facts for a second. Lewis was by his own admission present when Jacinth Baker and Richard Lollar were stabbed to death. You can find the police reports anywhere on the Internet, and the basics are on his Wikipedia page, however I have just a couple of questions. If you are one of the angry Lewis apologists (with handles like ‘RavensDude69’ and ‘BaltimoreBomber69’) who enjoys shouting down all dissenting voices and who has clearly never actually thought about it, I would love it if you asked yourself these questions. 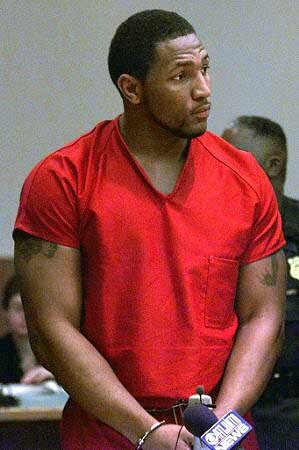 If Ray Lewis is innocent, then why did he and his posse ensure that his blood stained white suit, worn the night of the incident, ‘disappear’ and why has it never to this date been found? If he is innocent then why did he reach a very large financial agreement with the child of Richard Lollar, India Lollar, before a Civil case could be brought? In addition to that, why did Lewis pay off the Baker family? Why would someone who is innocent agree to pay off the families of the victims of a double murder? Seriously, ask yourself that for a second. If you or I are innocent when accused of murder, we spend the rest of our lives fighting tooth and nail to ensure we are cleared, right? No innocent person ever pays out cash. If you are paying up, you did something. How on earth is such a simple fact completely eluding the Lewis apologists? The prospect that is perhaps most galling is the almost nailed on certainty that Lewis will no doubt be hogging air time on US mainline sporting media sometime in the near future. Dressed no doubt dapper in a classy suit, watching his words carefully as he spits them out, Lewis will no doubt cut a fine figure, and his methodical rewrite on his own shady personal history will be almost complete.